Kidlit Spotlight: The Gorilla Picked Me! Who makes you feel special? Is it your other half? Your best friend? Your brother or sis? We all have that one person in our life whose puzzle piece locks right into ours. When we run out of ink, they fill in the blanks. When our strength wanes, they give us a piggy back ride across the finish line. Wherever we leave off, they pick up... and pick up the pieces while they're at it. Being in the presence of a rock-star confidant can make you feel like you're looking into the world's most flattering mirror. These magical people pull away the debris of self-doubt and allow our light to shine. I reviewed Michele McAvoy’s first picture book, My Superhero Grandpa, on the blog last year. Michele and I have a special link – we’re both represented by Stephanie Hansen, senior literary agent and owner of Metamorphosis Literary Agency in Kansas City. As picture bookers, Michele and I play in the same #kidlit sandbox on Twitter. I just adore her – the way you adore a summer camp friend who quickly becomes your favorite pen pal. You know what I also adore? The Gorilla Picked Me! My girls and I got our hands on an advance copy and we connected with it instantly - reading it three times in our first sitting. The Gorilla Picked Me! is a rhyming picture book about a little girl named Olive, who feels average as can be. At school, she's the last one picked for games. On Valentine's Day, she feels downright invisible. All Olive wants is to feel special... to stand out just once - not for being loud or flashy, but for being herself. Things seem to be falling into place when Olive attends the Spring Dance with the one person who values and champions her without judgement or hesitation: Her dad. But just as the party is getting started, Olive's dad has to slip away. Suddenly Olive feels all alone all over again... until... surprise! 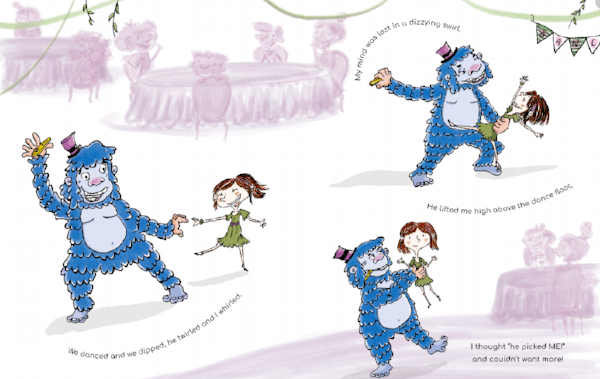 A gorilla shows up as the evening's entertainment and chooses Olive, over all the other kids, to be his dancing companion. By choosing her, the gorilla makes Olive's dream come true. But who exactly IS the dancer in that gorilla suit? Finding true friends and fitting in can be huge stressors for kids. Despite all the activity and commotion, school can be a lonely place - especially when you feel un-extraordinary. The Gorilla Picked Me! is a great book for a child struggling to find his or her place. It beautifully spotlights the power of being seen and celebrated. The Gorilla Picked Me!, published by Native Ink Press, was released March 3. Michele McAvoy (@michele_mcavoy) is giving away one signed copy of The Gorilla Picked Me!, plus great book swag (pictured), to the winner of my weeklong Twitter contest.